Cardiff manager Neil Warnock says his players should have surrounded referee Mike Dean after a "baffling" decision to overturn a penalty against Burnley saw his side edge closer to relegation. With the Clarets leading through Chris Wood's header from a corner, Cardiff were awarded a penalty when home defender Ben Mee headed the ball against his own arm. However, Dean reversed the decision after talking to his assistant Darren Cann - much to the anger of Cardiff's players. Wood headed a late second goal to leave the Bluebirds five points from safety with five games remaining after a sixth defeat in seven games. "My lads should surround the referee really; [Burnley] had three lads in his ear straight away," Warnock, who has been charged by the Football Association for controversial remarks he made about Premier League officials last month, told BBC Sport. "Can I say I'm lost for words? "The linesman gave it, the fourth official told me Mike didn't see it and yet Mike must have seen something because he's gone over and told the linesman that it's hit a part of his body so it can't be handball. "It's baffling really. I'm so gutted for my players. "I think Darren made the right decision and Mike has talked him out of it." Burnley boss Sean Dyche defended Dean for making a "big call". "I was thinking it's impossible the linesman could give it from there," said Dyche after his side's third straight league win. "I think the referee officiated it very well - there's nothing deliberate and the referee has done well to make a big call." In an incident-packed game, Burnley's Ashley Barnes was booked for kissing Joe Bennett on the nose after an overzealous challenge by the Cardiff defender. Cardiff can still mathematically stay up but Warnock's side are running out of time to save themselves from an immediate return to the Championship. Warnock looked dejected at the final whistle after another game in which the match officials failed to endear themselves to him. Having lost from a winning position against Chelsea last month when Cesar Azpilicueta headed in an equaliser from a clearly offside position, Cardiff were again on the end of a controversial decision. They were initially awarded a penalty for handball when Mee headed against his own arm but, after Dean spoke to his assistant, the decision was overturned. The visitors had further penalty appeals turned down including one when Aron Gunnarsson went down under a challenge by Charlie Taylor. Yet their lack of firepower again contributed to a 21st top-flight defeat of the season. With Burnley leading 1-0, Junior Hoilett sent his side's best chance over the bar as the Bluebirds, who have scored just 28 goals league goals this season, failed to score for the 15th time in 33 games. Cardiff, who face fellow strugglers Brighton on Tuesday, still have to face title-chasing Liverpool and top-four hopefuls Manchester United. Having lost three in a row, it will require a monumental effort to avoid joining Fulham and Huddersfield in the Championship. Burnley are all but safe after pulling 11 points clear of Cardiff. Having taken over with the club 14th in the Championship in October 2012, boss Dyche can start planning for a fourth successive season in the Premier League. This was never going to be a game that was pleasing on the eye but the Clarets were the better team. Although Wood got the goals, 19-year-old Dwight McNeil had another eye-catching game and provided the assist for the opening goal. Taylor was also strong at the back as the Clarets produced only a fifth clean sheet at home. 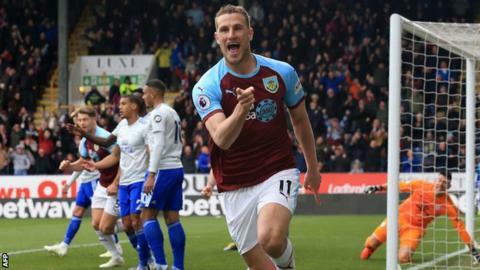 Burnley, should have been out of sight by half-time, Ashley Westwood missing two excellent chances when clean through while Wood, before he scored, headed against a post. While Barnes rarely looked like scoring, his first-half booking for a kiss produced one of the more bizarre moments of the season. Burnley manager Sean Dyche has never lost against Neil Warnock, winning five of his six matches against the Cardiff boss. Since the start of last season, Chris Wood has scored more Premier League goals for Burnley than any other player (20). Wood has been directly involved in four goals in his past two Premier League games (3 goals, 1 assist), as many as he managed in his previous 11. No player has been involved in more Premier League goals this season as a teenager than Burnley's Dwight McNeil (3 goals and 5 assists, level with Fulham's Ryan Sessegnon). Burnley have more than a week to prepare for Chelsea at Stamford Bridge in the Premier League on 22 April (20:00 BST kick-off). Cardiff are back in league action as early as Tuesday when they visit Brighton (19:45). Attempt blocked. Nathaniel Mendez-Laing (Cardiff City) left footed shot from outside the box is blocked. Assisted by Aron Gunnarsson. Goal! Burnley 2, Cardiff City 0. Chris Wood (Burnley) header from very close range to the high centre of the goal. Corner, Cardiff City. Conceded by James Tarkowski. Attempt blocked. Bruno Ecuele Manga (Cardiff City) right footed shot from outside the box is blocked. Offside, Burnley. Jack Cork tries a through ball, but Chris Wood is caught offside. Substitution, Cardiff City. Bobby De Cordova-Reid replaces Harry Arter. Substitution, Cardiff City. Oumar Niasse replaces Kenneth Zohore. Attempt missed. Ben Mee (Burnley) header from the right side of the six yard box misses to the right following a corner. Corner, Burnley. Conceded by Neil Etheridge. Attempt saved. Ben Mee (Burnley) header from the centre of the box is saved in the top left corner. Assisted by Dwight McNeil with a cross. Corner, Burnley. Conceded by Bruno Ecuele Manga. Substitution, Cardiff City. Nathaniel Mendez-Laing replaces David Junior Hoilett. Attempt missed. Chris Wood (Burnley) header from very close range misses to the left. Assisted by Dwight McNeil with a cross following a corner. Corner, Burnley. Conceded by Aron Gunnarsson. Attempt missed. David Junior Hoilett (Cardiff City) right footed shot from the centre of the box is too high. Assisted by Kenneth Zohore. Attempt saved. David Junior Hoilett (Cardiff City) right footed shot from outside the box is saved in the centre of the goal. Assisted by Harry Arter. Attempt blocked. David Junior Hoilett (Cardiff City) left footed shot from outside the box is blocked. Assisted by Aron Gunnarsson. Harry Arter (Cardiff City) hits the bar with a left footed shot from outside the box. Assisted by David Junior Hoilett following a corner. Attempt blocked. Harry Arter (Cardiff City) left footed shot from outside the box is blocked. Assisted by Víctor Camarasa. Attempt missed. Víctor Camarasa (Cardiff City) left footed shot from outside the box misses to the right.